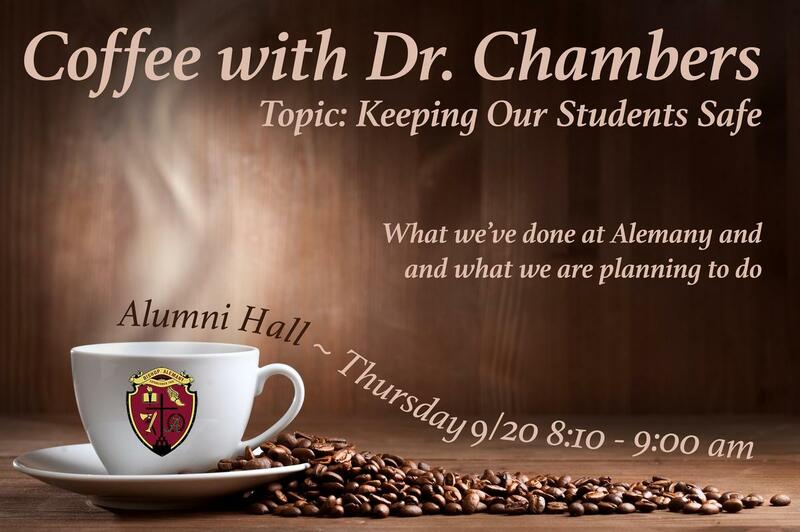 This coming Thursday you are invited to drop off your son or daughter and then come to Alumni Hall at 8:10am for coffee and some pastries with me. I'll be there to share on the topic of school safety for 45 minutes or so. Anyone who’s watched the news lately knows that this is a major concern for every school. I’d like to share with you what we’re doing here about that and get your suggestions, comments and questions. If you can’t make it, that’s fine. I’ll share it all with you on my journal page at Alemany.org a day or so later. 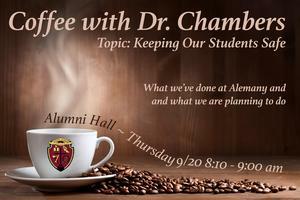 I hope to do this again soon and discuss other topics that affect your children and the school. If you have never met me, this is a good time to do that too. So, if you’re available this Thursday morning at 8:10am…drop in, enjoy a cup of coffee, a donut and join me for a discussion about safety.